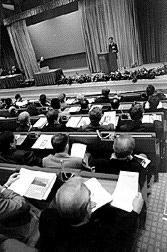 At an upbeat seminar in Aberdeen on February 15, 1996, more than 180 delegates, the majority from Scottish companies, gathered at the Aberdeen Exhibition and Conference Centre to learn about "Opportunities for UK Oil and Gas Supply and Service Companies in Azerbaijan. Left: Thomas Young, British Ambassador to Azerbaijan, addresses oil company representatives in Aberdeen, Scotland, about the investment opportunities in Azerbaijan, February 15. Seminar was sponsored by the OSO and SE, British government entities.
" The Seminar was sponsored by Oil and Gas Projects and Supplies Office (OSO), and Scottish Enterprise (SE). Over the next 15 years, an estimated $40 billion will be invested in Azerbaijan alone to develop reserves totaling at least 32 billion barrels of crude and 100 trillion cubic feet of gas. Azerbaijan is being considered as one of the hottest properties on the planet as far as the international oil and gas industry is concerned, a fact all the more remarkable since it was the birthplace of the modern oil industry more than 100 years ago. Tom Young, British Ambassador to Azerbaijan, came from Baku to address the session. Other featured speakers were Steve Remp, CEO of Aberdeen based Ramco, along with representatives from British Petroleum (BP), Scottish Enterprise, Offshore Supplies Office (OSO), Department of Trade and Industry (DTI), MAI Consultants, Consafe, and Clifford Chance (Legal Advisors). Until around 1990, the West had written off the Caspian Sea, believing that Azerbaijan has been wrung dry of its oil reserves during the Soviet era. But an entrepreneurial American-born oilman, Steve Remp, set about to demonstrate that this impression was wrong. Five years late, Remp's company, Ramco Energy, is a member of the largest international oil consortium ever assembled. Many participants wondered about the political stability in the region, given that Azerbaijan has neighbors like Russia and Iran. They were also concerned about what impact the war in Chechnya might have on development. Tom Young, the soft-spoken, low-keyed British Ambassador to Azerbaijan, believes the prize is well worth the effort, but that anyone expecting "an easy ride" had "better forget it." Young believes that Azerbaijan is definitely a country with a future. "This is not Chechnya or Armenia," said Young and he encouraged businesses to go to Baku to discover for themselves. "Don't be put off when you discover a market that isn't like Norway's or Dubai's. The rewards are still there. If they weren't, I wouldn't waste my time." Young cautioned that Azerbaijan had only passed 4.5 years since independence. "During this transitional period of post-Soviet reconstruction, no-one should be surprised by the confusion and disarray. But Azerbaijan's President, Heydar Aliyev, who came to power in 1993, has stood firm against many forces of opposition and is well-disposed to the West." The level of interest for the Azerbaijan seminar far exceeded previous record turnouts to such events, clearly demonstrating that the oil industry is the UK is beginning to "get the message" about Azerbaijan. Nigel Ross is Director of Scottish Enterprises for the CIS. According to Nigel Ross, who directs the CIS Division of Scottish Enterprises (SE), there is great potential for Scottish companies seeking to get involved in Azerbaijan's oil industry which is currently in a embryonic stage similar to the early days in the North Sea. "Technological solutions of the UK are proving to be crucial for the development of the oil and gas industry in Azerbaijan and the surrounding Caspian Republics," according to Ross. Scottish Enterprise (SE) which is Scotland's National Economic Development Agency has found a way to facilitate access for Scottish companies into Azerbaijan. In May 1995, Tim Eggar, UK's Minister for Energy, officially opened SE's new company which is known as Scottish Caspian Trade (SCT). Eggar was in Baku along with the Energy Ministers from the US, Norway, and Turkey to open the 95 Caspian Oil and Gas Exhibition with Azerbaijan's President, Heydar Aliyev. In Baku, SCT serves as an umbrella organization to assist Scottish firms competing for new business in Azerbaijan. Companies join on an annual basis until they can get a "foothold" in Azerbaijan and create their own customer base. Usually within a year or two, the companies are well enough established and can handle the challenges of this new environment themselves. In the meantime, SCT offers access to a professional Azerbaijani team headed by Victoria Osipenko and Samad Abasguliyev who provide market information, sales and marketing representation, and advice on contractual negotiations. This service enables companies to get started with minimal start-up costs and helps them minimize administration inconveniences and lower their risk of investment. Several Scottish companies working with SCT since last year have already succeeded in gaining significant business in Baku which total more than $3 million. They include Consafe (JV fabrication yard), Rowco (freight) and Hogarth (protective clothing). In Moscow, SE's sister company, ScES, has already generated an excess of $120 million since its founding in 1992. Scottish Enterprises, the parent organization of both SCT and ScES, employs a staff of 4,600 and operates with an annual budget of $800 million.